Overactive bladder syndrome is a common condition that can affect both men and women of all ages. Symptoms can include frequent urination, increased urination at night to sudden urgency to urinate. Occasionally this can lead to accidental loss of urine. For many sufferers this can be quite embarrassing and disruptive to social and working lives. To best understand overactive bladder syndrome it is worth understanding how a normal bladder functions. The bladder receives urine from the kidneys to be stored ready for urination at an appropriate time. As the bladder fills nerve signals are sent to our brains informing us of the need to urinate. On urination there a two types of muscles involved, those surrounding the urethra and those surrounding the bladder (detrusor muscles). 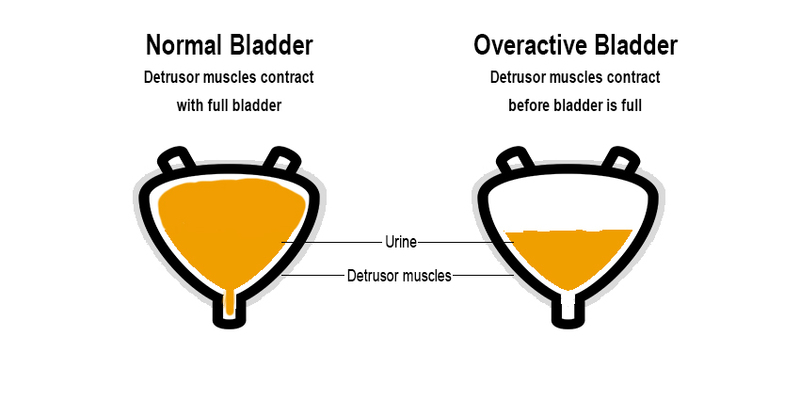 With an overactive bladder the surrounding bladder muscles (detrusor muscles) contract involuntary causing urgency to urinate. They may even start to contract when the bladder is only half full. In most cases the cause of an overactive bladder syndrome is not fully understood but it involves an overactivity or amplification of nerve responses, referred to as sensitisation. There is in increased likely hood of this occurring with age. Before a diagnosis of “overactive bladder syndrome”, other causes may need to be ruled out such as acute infections, neurological conditions, diabetes and more. It is therefore important to see a registered health professional who may request further tests. Once a diagnosis has been confirmed their are numerous treatment options available these may include medications from your GP that help relax your bladder, physiotherapy, lifestyle changes such as loosing any excess weight or reducing caffeine and alcohol intake. Other conservative treatments recommended on NICE guidelines where medication has been ineffective is percutaneous tibial nerve stimulation a form of electroacupuncture. Acupuncture has long been used to support Kidney and Bladder functioning. Notably acu-point kindney 7 (Ki 7) or Spleen 6 (Sp 6) have received a lot of attention over the passed decade for its involvement in the treatment of over overactive bladder. Due to the points location over the percutaneous tibial nerve it is understood that electro-stimulation sends impulses to the lumbosacral plexus causing a relaxation affect to the detrusor muscles of the bladder. This in turn reduces the urgency to urinate.